As I mentioned in my other article, one of the earliest known uses of the lottery was back in ancient China, particularly during the Han Dynasty, somewhere between 205 and 187 BC. Keno was the game of choice back then—a lottery-like game that is still played in some casinos today. 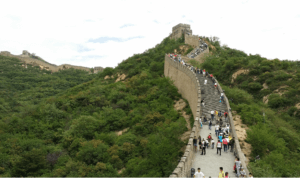 Lottery funds helped build this Chinese landmark. Similar to the function of lotteries today, the people in ancient China used the funds to supplement the costs of various government projects. One of the biggest projects that historians believe the keno lottery helped fund was the construction of the famed Great Wall of China. In the West, historians believed that the first ever appearance of lottery games in Europe was during the period of the Roman Empire. Initially, lotteries were solely held for the amusement of guests at dinner parties. Not everyone was able to join the games—it was an activity exclusive to the nobility and ruling class. Lotteries were simply for amusement back then. It wasn’t until Augustus Caesar became emperor of the Roman Empire that the lottery scene changed. During his reign, the first instances of tickets being used at lotteries were recorded. 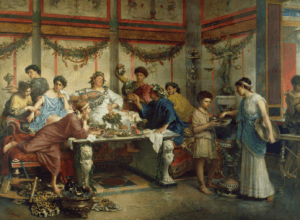 While the funds were used for repairs to the city of Rome, lottery winners received prizes, such as dinnerware but never money. Although historians strongly believe that the early British people played various games of chance, it wasn’t until the late 16th century that they actually began offering lotteries to the public. In 1567, Queen Elizabeth I chartered the first ever English lottery which targeted the upper class. 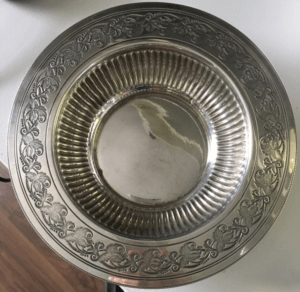 Who would’ve thought silver plates were offered as lottery prizes? Interestingly, every ticket holder back then won a prize, which usually consisted of silver plates and other commodities. As an added incentive, all ticket holders were granted immunity from arrest, as long as the crime wasn’t a felony, piracy, murder, or treason. The lottery was used to raise money intended for large infrastructure projects, like ship-building or for settlement efforts in the New World. In other words, it served a purpose similar to our modern lotteries, with funds going towards education and public works. The last lottery collapsed in 1826 when opposition in Parliament pressured the government to end it amidst allegations of corruption and mismanagement. Lotteries in colonial America were quite instrumental in helping build the foundations of what was to become the United States. In fact, more than 200 lotteries, sanctioned between the years 1744 and 1776, were pivotal in the construction of bridges, canals, churches, libraries, and roads. And lotteries also played a part in the construction of several universities—like Harvard, Yale, Columbia, Princeton and the University of Pennsylvania. Beyond infrastructure, lotteries back in colonial America also helped bolster the local militia. In May 1758, lottery was used by the Commonwealth of Massachusetts to support the “Expedition of Canada.” Even Benjamin Franklin used lottery to finance the cannons they used during the Revolutionary War. 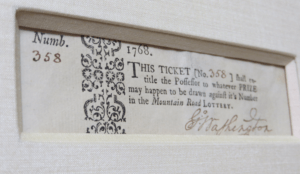 Founding father George Washington also took a stab at organizing a lottery in 1767, but the Mountain Road Lottery ultimately failed—partly due to having too much competition. It would have helped build a road that went through the Allegheny Mountains and construct a resort in the area. The lottery tickets that George Washington signed would go on to become expensive collector’s items. In fact, one ticket sold for $13,500 in 2006, while another sold for $15,000 in 2007. One of the actual lottery tickets signed by George Washington himself. The Mountain Road Lottery wasn’t the only lottery that Washington was involved in. Growing up in a society where slavery was the norm—Washington himself was a slave owner at age 11—he also managed Col. Bernard Moore’s “Slave Lottery” in 1769. Just as the name implies, the advertised prizes were slaves (along with land). Throughout the French and Indian Wars from 1754-1763 and the American Revolution from 1765-1783, numerous lotteries helped in the war efforts—and remained popular even after the Revolution. However, in the late 19th century, lotteries became so mired in scandals and mismanagement that in July of 1890, President Benjamin Harrison insisted that Congress enact “severe and effective legislation” against lotteries. Congress promptly enacted a law that banned lottery tickets distributed via US mail. In 1892, a law was upheld to stop all lotteries in America by 1900. [h2 display=”The Resurgence of Lotteries” menu=”Resurgence of Lotteries”] At the start of the early 20th century, different forms of gambling were largely illegal in the US, parts of Europe, and in other countries. It wasn’t until well after World War II—specifically in the 1960s—when lotteries began to make a comeback. The reason? Governments needed to raise additional revenue to fund various projects. Instead of raising taxes, which is always unpopular, lotteries were seen as a “voluntary” tax. In the United States, the very first modern lottery appeared in 1964, in New Hampshire, while the first interstate lottery, which involved 3 New England States, was introduced in 1985. Three years later, the Multi-State Lottery Association (or MUSL)—which included the District of Columbia, Iowa, Kansas, Missouri, Oregon, Rhode Island, and West Virginia—was formed. It also gave birth to Lotto America, which would eventually evolve in 1992 into what is arguably one of the most popular lotteries around: US Powerball. The Betting and Lotteries Act in 1934 reintroduced lotteries in the UK and further acts passed by Parliament in 1956 and 1976 set more rules and regulations. In 1993, the government created the first state-franchised lottery and granted a license to the fledgling UK Lottery. A year later, on May 25, 1994, the franchise to the National Lottery was awarded to the Camelot Group. To this day, they still hold the franchise rights to the National Lottery—despite a very public spat and controversy with their rival, The People’s Lottery, backed by none other than Sir Richard Branson. [h2 display=”Modern Lottery and the Future” menu=”Modern Lottery”] Today, lotteries still serve a similar purpose as its predecessors which is to finance government projects, public works and charitable organizations. However, the internet has drastically changed the way people play the lottery. Sure, you can still buy a ticket the old-fashioned way, but you can also play on-the-go as long you have a mobile device and an internet connection. The lottery has become more accessible and it’s certainly not just for nobles anymore. A ticket is more affordable, so gone are the days when all you could afford was to split a single ticket with family or co-workers. And the number one reason to buy a ticket today is, wait for it…huge jackpots! When the Powerball hits close to $1 billion, it’s a no-brainer! I bet most of you spend more than the cost of a ticket on a cup of coffee or espresso or a pint of beer in a day! And the theater world has embraced the lottery! Hamilton, the acclaimed musical by Lin-Manuel Miranda, offered $10 tickets available through a digital lottery called “Ham4Ham.” Alexander Hamilton would be proud. Coincidentally in 1793, he wrote a 2-page document, Idea Concerning A Lottery. A man before his time, modern lotteries adopted some of his proposals–simplicity, cheaper tickets and a bigger jackpot! Lottery – you’ve come a long way, baby! Who knows what the future holds but I plan on taking a front row seat!